Note: The Dr. Drew site has gone through some significant changes. 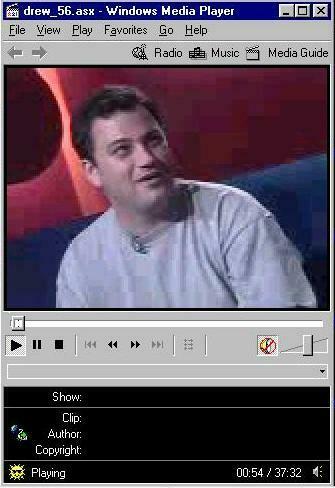 As far as I can tell, the celebrity interviews (including Jimmy's) are no longer available. I had no idea that Dr. Drew even had his own online show, until someone on the Jimmy immel mailing list brought it up. I went to the site and watched most of the video. It was pretty enlightening. 16:40 into the show a woman calling herself “Mrs. Ace Rockola” talked to Jimmy and Dr. Drew. She knew a lot about Jimmy. He wanted to know who she was. I’m kind of curious myself. I figure it was either someone on the Jimmy Kimmel Mailing List, or someone who visited this site. This is what the show will look like (screen size set to 200%) when you watched it at a 56k connection with the latest Windows MediaPlayer. The sound was very smooth. The video was a tad choppy when people moved around a lot. It was a great video. 5 Minutes into the show, Drew & Jimmy discussed Jimmy’s rather uncomfortable medical problem. If you don’t know what it was, you can hear him talk about it in my sounds section. The video was available HERE, but it has been removed by the people at DrDrew.com. Speaking of web sites. During the interview Jimmy mentions a web site run by a big, fat, gay guy. Since my web site was the largest online source for Jimmy info during that time (and the only Jimmy site run by a guy), I assume he was referring to my site. I may be 6'5" but I'm no Rumpian*. Jimmy was just using his artistic license to create comedy. * Rumpian (same as "Chodler") = On KROQ, homosexuals complained that Adam Carolla's use of the the word "homo" was offensive because the word was sometimes used by people who beat up homosexuals. In response Adam made up some new words for homosexuals such as "Rumpian" and "Chodler." Since the words were new, they couldn't have been used in a derogatory fashion before.